It's not a crazy thing for one site to devote a day's posting to another site, when the other site has birthed a beautiful thing, an actual object of bound pulp and print, involving so many contributors to this site, including Carrie Hoffman, Shauna McKenna, Bryson Newhart, Ed Page (he drew the girl with heart ballon above), and editors Whitney Pastorek and Jeff Boison, not to mention he who maintains this domain's deployment and writes the words you read right now. There's also an introduction by John Hodgman. 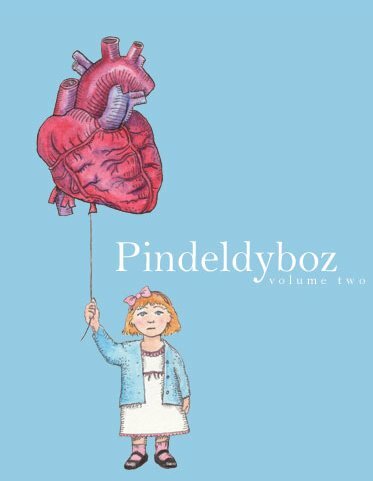 It's not a crazy thing to spend $12 on a copy of Pindeldyboz #2. It's a very good thing to do. Go to that other site now to learn more. Or just order a copy on your credit card. You won't regret.